When I hear the word Christmas I think of crackling wood in the stove and the smell of candles. The glimmer of Christmas lights. The tinkle of many bells penetrates the hearts of people and fills them with joy, as they are busy getting ready for Christmas. There are so many things to do for Christmas. Yet those difficulties are smoothed away with smiles and happiness. Christmas is a time for presents and for watching the joy of a little girl hugging her first doll. It is a time for presents under the Christmas tree, as if the tree itself had worked an unbelievable miracle. When at last Christmas comes, the eyes of parents light up with delightful mischief. It is a time when sweethearts hold hands and exchange promises that need no words. Christmas is a time when old folks think of eternal life. When people who have been away from church for a long time wake up and start to act like children of God again. When persons who usually only think of themselves look into their hearts. Christmas is a time when hatred and regret are completely forgotten. It is a time of peace. It is a time when we become like children and God comes to us. It is a time that brings a spiritual peace that never ends. These are some reflections on Christmas, but aren't the following words the most important? 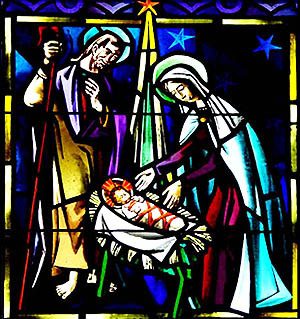 Christmas is the time when the whole world sings a lullaby to the Infant Jesus.